We set out from Rishikesh with great enthusiasm not realizing that Vanamali (Krishna) had another surprise for us. From Rishikesh we had to go to Karnaprayag and then take the road to Ranikhet which would bring us to Dwarahat which was to be our base camp. Suddenly I started noticing a sign post which said “Adi Badri”. For those who are not in the know, there are two great temples in the Himalayas known as Kedarnath, which is dedicated to Shiva and Badrinath dedicated to Vishnu. 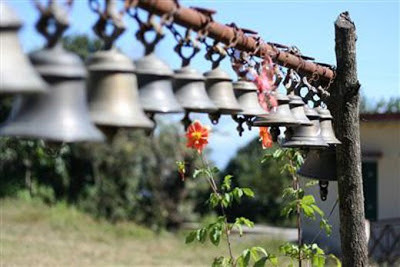 Each of these has five smaller temples dotted all over the Himalayas known as “Panch Kedars” and “Panch Badris”. “Panch” means five. Adi Badri is the name of the first temple complex among the Panch Badris. All of these are dedicated to Lord Vishnu. Five of the most important Badris are known as Bhavishya Badri, Vriddha Badri, Vishal Badri and Yog Dhyan Badri. Of course the most famous of these is Vishal Badri and is located in the very high ranges of the Himalayas. It is snow bound during six of the winter months. Devotees make a visit to one of the other temples when Badri Vishal is closed during winter. These temples were all built during the Gupta period which extended from the 5th to the 8th century. Adi Shankara, the great proponent of the Advaita philosophy is the one who built all the temples. Adi Badri is only 17 kms from Karna Prayag but I did not know this. I was really excited when I saw the sign post and told the driver to go there since this was a temple I had wanted to go to for a long time. Imagine my delight when we came to a village called Chulakot and then just at the turning we suddenly came upon a cluster of temples with the huge signboard – “Adi Badri”. I couldn’t believe this and excitedly told the driver to stop. We jumped out and ran up the steps to a number of exquisitely carved little temples. There was a watchman there since the whole place had been declared as an ancient monument. The main temple has a delicate figure of Lord Vishnu in black stone with four hands holding the discus (chakra), conch, lotus and mace in each of his hands. This is typical of all Vishnu idols. There is a raised platform in front of the main temple opening on to the shrine of Lord Vishnu. The priests here, as in Badri Vishal, are from South India. This was decreed by Adi Shankara because he wanted to unite the whole of India. The priests at the temple of Rameswaram in the far south of the country are from Uttarakhand. After this we proceeded to Dwarahat where we stayed the night. The next morning we set out for the Manila temple. It was a four hour drive up hazardous and winding roads. En route we stopped at the gorgeous Bhumi Devi temple. It is on a small hillock in the middle of the Rama Ganga and is dedicated to the Earth Goddess. 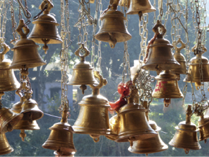 The bells round the temple were really mystical. 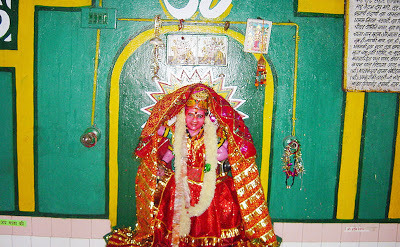 Manila village is actually a little known place and is the abode of Manila Devi, the family goddess of the Katyuri clan of Rajputs. It is at an altitude of about 1800m. From top of the hill on which the temple is situated we could get a 180 degrees view of the snow covered mountains seemingly within our reach. The view literally took our breath away. Apparently the peaks are only 10 km from Manila straight as the crow flies. It was an awe- inspiring view of the highest peaks in Uttarakhand, like Nanda Devi, Trishul, Panchachuli etc. which were silhouetted against the incredibly blue sky which is a remarkable feature of the mountains. The air is so pure that you feel like drinking it. There is a perfume of the herbs all around and the constant chirping of birds drenches your soul in delight. A climb through pine forests took us to the top of the hill where the temple is situated. 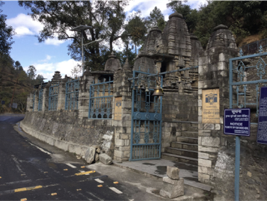 Manila Mandir is very old but not as well known as many of the other temples in the Kumaon district. Thanks to this, it was fairly deserted and we had the whole place to ourselves. The temple has two parts, one called Manna Manila Mandir and the other Talla Manila Mandir. The one we went to was the Talla Manila Mandir and is the original one which is supposed to have been built in the 5th century. The other temple is 6 kms away from here in which the hand of the goddess is supposed to be kept. The whole place is mesmerizing with its panoramic views and strange looking tree. I must admit that the ornate golden temple entrance put me off a little since I had been expecting an ancient looking shrine. However the priest assured me that all the idols were ancient. They had only been given modern settings. I was happy to hear that. Unfortunately as is usual with all north Indian temples, the idol was totally covered with some shining cloth. At my insistence the priest lifted up just a bit of the lower right side and showed me the face of the buffalo demon –Mahishasura. I was quite thrilled. Her face which was above the drapes was also very beautiful. No wonder she is described as enchanting. There was another idol beside her but he didn’t explain what it was. The mystery and magic of the place could be inhaled in every breath. 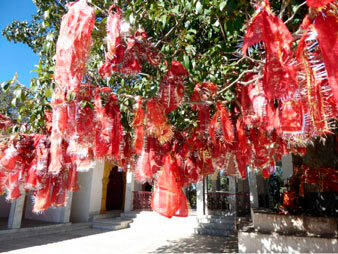 The huge tree just outside the shrine was filled with red scarves that had been offered and tied there by the pilgrims. The priest said that the tree was ancient. It was as old as the idol of the goddess which meant it must have been about 1, 400 years old. Moreover, he said, nobody knew what type of tree it was. Many botanists had come there to inspect the tree but none of them could place it. The tree is covered with red scarves, tied by devotees along with their wishes. 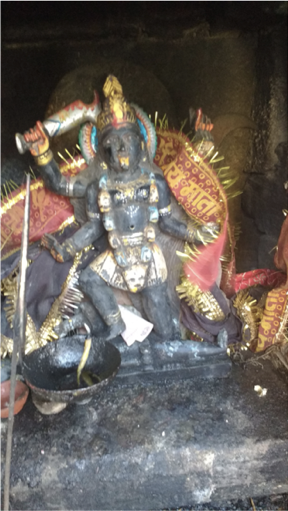 There was a fantastic idol of Kali dancing on the supine form of Shiva in a small shrine outside the temple. This is a very rare pose and though I had seen it as a photo I had never seen an actual idol of this. Luckily I managed to get a photo of it. It was a beautiful place to meditate since there were no crowds. While the priest was offering food to the goddess I went and sat on a platform in front of the temple and started to meditate. I was anxious to see her form as Mahishasura Mardini (Slayer of the buffalo demon), but somehow this image eluded me and all I could see was Lakshmi seated on a lotus with elephants on either side. It was a striking image and it lingered in my mind. At last I got up and went back to the temple and asked the pujari what the second idol was about. At first he kept insisting that it was Kali but at my persistence he revealed the fact that the second idol was actually Vishnu with all his accoutrements. Now the reason for my vision became clear. Since I was a Vaishnavite (devotee of Vishnu), I suppose I was given this particular vision by Lakshmi, the consort of Vishnu. All of us were most reluctant to leave this beautiful place and return to our cold hotel room. But again we had a treat in store. As we were reaching, there stretched out before us, a magnificent sunset all pink and red and gold.